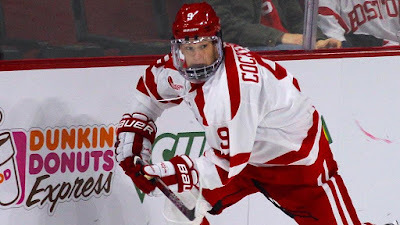 Logan Cockerill, who scored the game-winning goal in Saturday’s QF series-clinching win against Connecticut and assisted on Bobo Carpenter’s overtime goal on Friday, has earned Hockey East Rookie of the Week honors. Cockerill is currently on a ten-game points streak. Two Terriers earned spots on the weekly top performers list: Jordan Greenway, who scored twice on Friday and added an assist Saturday; and Chad Krys, whose third-period goal Friday sent the game to overtime. With its quarterfinal sweep, BU moved up two spots to #18 in this USCHO weekly poll. The Terriers also sit at #18 in the Pairwise Rankings. While BU can assure a spot in the NCAA tournament by winning the Hockey East title, there are a few scenarios that don’t require a title, that would punch BU’s ticket, like this one. But a huge number of game results must fall into place. 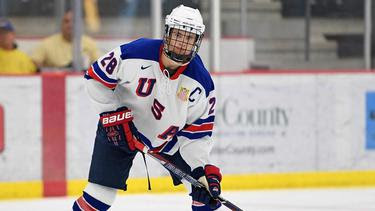 The Draft Analyst has reviewed the top draft-eligible performers at the recent Five Nations Tournament in Plymouth, Michigan, won by the NTDP U18s. His top two U.S. performers included 2018 recruit Joel Farabee, whom TDA ranks #7 for the upcoming NHL Entry Draft. It’s rare to find a skilled playmaker who consistently hustles and makes physical sacrifices regardless of how long he’s into his shift. Yes, Farabee is a top-line winger who plays with two elite forwards in Oliver Wahlstrom and Jack Hughes. But he leads by example and is willing to pay any price in order to grab control of the puck. If your eventual draft positioning was dependent on play away from the puck and taking the hard right over the easy wrong, then Farabee would go first overall by a country mile. The thing is, the kid is an elite passer and fast skater who in Plymouth tailored his all-around game to compliment the younger Hughes, who did most of the puck handling when it came to zone entries and on the power play. On Sunday, 2018 recruit Jake Wise assisted on a pair of goals; while Farabee had one helper in the U18s' 9-5 win against Tri-City. Former Terrier All-American and longtime NHLer Mike Grier’s Junior Terriers 14U team has won the Massachusetts District championship, defeating the Junior Eagles. They will play in the Nationals in Charlotte, NC next month. Grier, whose squad includes his son, Jayden, also is an assistant coach at St. Sebastian’s where three future Terriers, goalie Drew Comesso and forwards Liam Connors and Liam Gorman compete. With six points in two games, @sjbarracuda forward John McCarthy is the @CCMHockey / AHL Player of the Week. producing an impressive 1.10 GAA and a .955 save percentage in 18 regular-season games. She also helped Team B.C. win a bronze medal in the 2018 National U-18 Championships.